There is a fairly large consensus around the opinion that “Brexit” is neither good for Great-Britain nor for the EU. However, its consequences appear particularly damageable for the United-Kingdom and positively disastrous in case of a “no deal exit”. Inside the Union, while there are sincere regrets concerning the departure as well as a recognition of the significant contributions made by the UK, those who wish to pursue an “Ever closer Union” believe that Brexit might give a new impulse to European integration; the last major step forward in this process was the introduction of the single currency in 1999 which still remains uncompleted. In parallel with this standstill, the first years of the new century saw a marked increase in the opposition to globalization. It has been evidenced by the steady increasing influence of national-populist parties, especially in developed countries where the competition of emerging nations and the acceleration of technological innovation have been particularly resented, leaving by the wayside those whose jobs became obsolete or required additional skills. In the United States, as well as in the EU, the credo in continuous progress, that would ensure that each generation would enjoy a better life, lost its appeal. It manifested itself initially by the stagnation and subsequently the regression of living standards among the most vulnerable segments of the population, extending progressively to encompass the middle classes. Simultaneously, at the other end of the spectrum wealth creation rewarded highly skilled workers and, most of all, the already wealthy owners of capital. The freedom of movement of capital, considered an absolute dogma, generated competition among governments to attract investments, allowing the owners to duck – perfectly legally in most cases – the imperatives of “solidarity” that underpin social cohesion. This explosion of inequalities contributed massively to the feeling of “injustice” that underpins the movement of the “Yellow Jackets” that erupted quite unexpectedly in France last November, catching not only the government wrong footed but also all the political parties and the trade unions. One of the consequences of the movement was to stop dead in its tracks the efforts of President Macron to reboot the European agenda by forcing him to concentrate on his domestic priorities. The discourse vaunting an “EU that protects” economically, socially and militarily has become totally inaudible. Nevertheless, it is the only one that can guarantee in the long run the prosperity and the preservation of the values of the Union within a rapidly changing world and protect the Member States from vassalization by the world’s great powers and by the United States in particular. The situation that is unfolding in France must be analyzed within the European context where some national-populist parties are already in government or, elsewhere, carry enough weight politically to force traditional parties to take account of their demands. 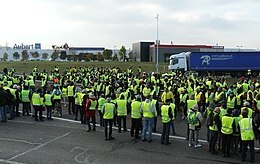 One can already guess the growing tensions that will develop between the French government and the Union if the pressure exercised by the “Yellow Jackets” leads either to reforms that upset the fragile budgetary equilibrium or to a resurgences of the civil unrest, compromising the rule of law. In either alternative, there is a danger of contagion that will inevitably contaminate rapidly financial markets. A new Eurozone crisis will catch the governments and the ECB largely unprepared, the former being significantly more indebted than in 2008 and the latter having already accumulated massive amounts of sovereign debt on its balance sheet while having no further room to act on interest rates. Within this context, where there is an evident lack of political will, it is hard to imagine a solution involving the reinforcement of the mechanisms of European solidarity as was the case in 2012 and 2015, however necessary, desirable and available such additional resources may be. Nonetheless, the urgency that confronts Europeans is not fundamentally financial but is rapidly shifting to concerns about freedom and democracy. These would inevitably be put under severe strain if controls at national borders and national currencies were restored, leading to a crisis of planetary scope. That is why, forgetting all the polemic surrounding Brexit, whether in the UK or within the EU 27 Members, the absolute priority must be to ensure that the UK remains a Member of the Union, using the opportunity resulting from the ECJ’s decision to allow the UK to rescind unilaterally its withdrawal notification under Article 50 of TFUE and restoring the situation to the status quo ante. Such a decision would undoubtedly irritate a great number of citizens in the 28 member States who would find numerous pertinent reasons to oppose it. As far as I am concerned, despite the reservations that I may have expressed in the past, I am convinced that the membership of the UK in the Union will considerably reinforce the rampart that we are all called upon to defend against the national-populist trends that threaten us.